Animated preschool series. 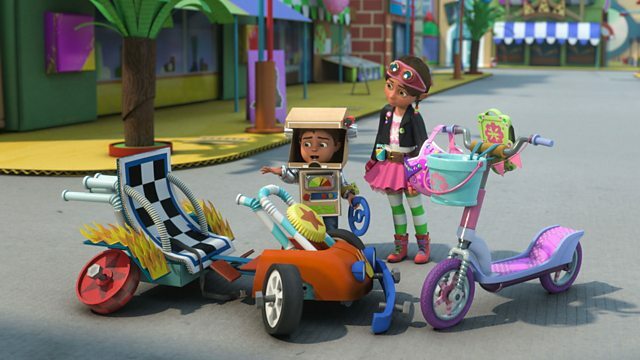 It's race day in Craft City and Bob is determined to come first, until disaster strikes and his go-kart starts falling apart! # Bitz & Bob, Bitz & Bob Bitz & Bob! # We can work it out! Is it time yet, Bitz? Can we start the Wheelie Day Race? I'm going to win. Can we start now? Um, as soon as I put this ramp in. some obstacles, and a big jump. two speedy racers arrived for the big Wheelie Day Race. -I've got my scooter and I've got my helmet. Whoa, Robo Racer, we need to wait for the other racers to get here. -You need everything tightened up for a race like this. Just listen to that crowd, they're loving the Bevelator! -OK, my scooter is ready to go, go, go. How's your checkup going, Bob? Huh? Oh, yeah, great. Uh, all done. The race for the Wheelie Day trophy is about to begin. And Robo Bob is going to win that trophy! Good luck, Wheelie Day racers. And the Bevelator roars into the lead. -Nobody stands a chance against this guy. -to keep me out of the race. Get ready, everyone, first obstacle ahead! Oh, my shelly sequins! I'm in the lead! I'm winning! I need a selfie of this. Ha-ha! Woo, yeah! Looking good! -Ah-ha! Nothing stops the Bevelator! Brum-brum! Robo Bob, coming through. -Argh! My steering wheel is loose. But there's no time to fix it, I want to win that trophy! -Whoa, whoa, whoa, whoa, whoa! -My go-kart is a no-go kart, Bitz. -We'll make it go again. -Um, maybe I missed that one. I'm not going to win that trophy. It's no time to give up. It's time for a Bitz Brain Blitz! because I had a list which helped me check everything. But my list was made just for my scooter. which means I need to make a list just for Bob. and the go-kart is race-ready! A checklist will make sure that we don't miss a single bolt. -Oh, but I haven't got my wrench. Woohoo! We did it! Every bolt has been checked and tightened. -Let's go, Bob! There's a trophy to win. The Bevelator totally owned fifth place. My first Wheelie Day trophy. We should have checked the shelf was tight first. It's race day in Craft City and Bob is determined to come first and win the trophy, until disaster strikes and his go-kart starts falling apart! Has Bitz got a solution?